The Botanic Gardens in Warrnambool were commenced in the 1850's with a Crown Grant of ten acres near the mouth of the Hopkins River. The poor soil coupled with the notorious south-westerly winds forced its abandonment after some years. Charles Scoborio was the first curator and Scoborio Reserve was named as a reminder of this early but unsuccessful struggle to create a botanic garden in the city. Two new locations were considered in 1866. The site of the Friendly Society's Park in West Warrnambool was eventually rejected in favour of the 20 acres of the present Botanic Gardens. At that time the area selected was a howling wilderness being heavily timbered with a dense undergrowth of scrub, ferns and tussocky grass. Difficulties with the site and problems with funding plagued the early years. Finally in 1877 a dissatisfied Council commissioned William R Guilfoyle to design an appropriate layout. Guilfoyle succeeded Baron von Mueller as the Director of the Royal Botanic Gardens, Melbourne in 1873. Eventually, in 1879, Council accepted a plan which incorporated all the elements of Guilfoyle's classic style - wide curving paths, large sweeping lawns dotted with specimen trees, glimpses of water, dense shrubberies displaying a rich variety of plants and focal points composed of plants of dramatic form and colour such as Doryanthes, Palms and Bamboos. By the end of the century a transformation had taken place. A visitor in 1891 noted that the formerly rugged piece of ground had been converted into a tranquil and beautiful park. 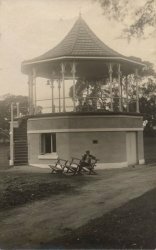 Additional attractions had been included: a fountain with gold and silver fish, a fernery, rockeries, several aviaries and a number of animals such as monkeys, kangaroos, wallabies and guinea pigs. The aviaries of birds and the collection of animals have long since disappeared, but the restored fountain and fernery continues to delight. Through the years the Warrnambool Gardens have remained an important part of the life of the city. While many other provincial botanic gardens have suffered from the encroachment of barbeque areas and caravan parks, the Warrnambool City Council has steadfastly resisted the trend.